See pack for full dosage instructions. For all levels of hardness of water Always follow garment label instructions, especially for washing temperature. Wash new items separately for the first wash. For machine wash dose product either in the drawer or in a dosing ball. Wash hands after use. 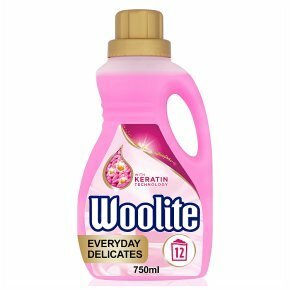 WARNING<br><br>WOOLITE Delicate Care causes serious eye irritation. Keep out of reach of children. IF IN EYES: Rinse cautiously with water for several minutes. Remove contact lenses, if present and easy to do. Continue rinsing. If eye irritation persists: get medical advice/attention. IF SWALLOWED: Call a doctor if you feel unwell. If medical advice is needed, have product container or label at hand.